2018-19 Plastic Free Hawaiʻi School Mural Contest! Our Plastic Free Hawaiʻi School Mural Contest deadline is February 22! 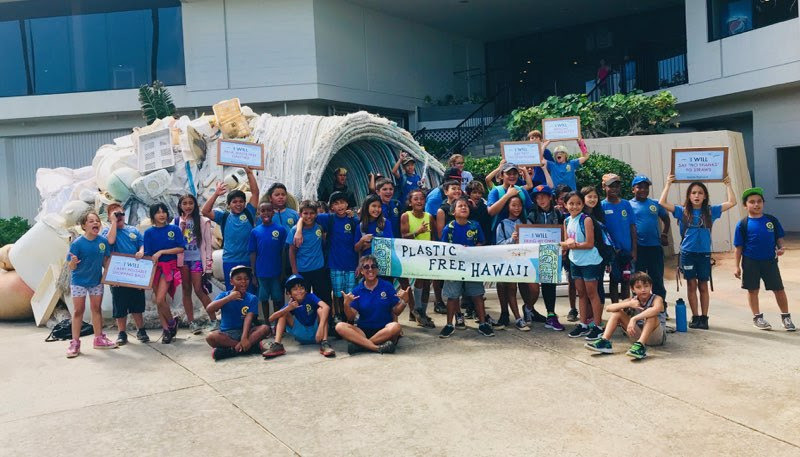 Bring your vision of a Plastic Free Hawaiʻi to life by incorporating marine debris, plastic bottle caps or other single-use plastic items collected from the school, families, or beach/campus cleanups. Hawaiʻi students and school groups (K-12) are eligible to participate. The grand prize winner will receive a water refill station for their school and runners-up receive Plastic Free Hawaiʻi prizes. Entries must be emailed to [email protected]kokuahawaiifoundation.org with an entry form and photos by February 22. Click here for entry form and complete details. Need inspiration? Visit the Plastic Free Wave art sculpture created by Ethan Estess from marine debris on display at Turtle Bay Resort through March 3. Couple your visit to the Plastic Free Wave with a field trip to Kahuku Point with KHF and North Shore Community Land Trust for a beach cleanup, outplanting native plants, and to observe nesting albatross. Email [email protected]kokuahawaiifoundation.org for more information.